Verani Realty and Broker’s Title & Closing teamed up this holiday season and used The Force during a Star Wars: The Last Jedi screening to bring cheer to local children. Verani recently sold tickets for a VIP advance screening of the highly anticipated chapter in the blockbuster series to benefit the Marine Toys for Tots Foundation, and collected new, unwrapped toys to help make sure every child has a toy under their tree this holiday. The sponsor of the event, Broker’s Title & Closing, generously offered to match what Verani raised from ticket sales, bringing the grand total of the cash donation to $1700. 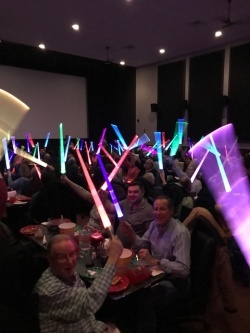 Over 100 agents and staff gathered at Chunky’s Cinema and Pub in Manchester for a night of light saber battles, pizza, and drinks for a good cause while they enjoyed the much buzzed-about film. The event was held through VeraniCARES, Verani’s social development division. Through VeraniCARES, agents and staff have the opportunity to donate to a fund dedicated to improving the communities Verani agents serve and live in, and Verani matches up to $10 per sales commission or donation. Steve White, an agent out of Verani’s Londonderry office and a graduate of the Platoon Leader’s Class – Marine Officer Training in Quantico, VA, suggested the Toys for Tots drive and helped coordinate it among the offices. "Marines are our heroes - they protect and defend us, but they also collect toys over the holidays because by serving the children of challenged families, they serve us all,” said White. “We at Verani are honored to be able to assist in this worthy effort, and look forward to partnering with the USMC and our communities again next year!" In addition to the fun night of fundraising, Verani and Broker’s Title collected toys for two weeks leading up to the event. The lobby of Verani’s Londonderry headquarters was stacked with boxes of toys, which were picked up by Marine First Sergeant Jason DiCosimo. 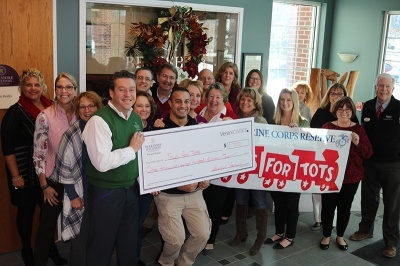 DiCosimo said their chapter of Toys for Tots serves six counties across southern New Hampshire, with over 100 stops. “We’re looking forward to coming back next year,” he said with a smile as he loaded up the boxes. The Marine Toys for Tots Foundation is a nonprofit dedicated to helping millions of less fortunate children enjoy their Christmas by collecting and distributing new toys.